My guest this week is Jordan Shapiro, PhD, a world-renowned thought-leader on global policy, education, game-based learning and parenting in the 21st Century. Jordan is a senior fellow for the Joan Ganz Cooney Center at Sesame Workshop, and Nonresident Fellow in the Center for Universal Education at the Brookings Institution, and is an international speaker and consultant whose fresh perspective combines psychology, philosophy, and economics in unexpected ways. I wanted to bring Jordan on the podcast after reading an article about his new book, The New Childhood: The New Childhood: Raising Kids To Thrive in a Connected World, that piqued my interest, as it offered a point of view on the role of screens and technology in the lives of children that was different from what we so commonly hear. The New Childhood draws on groundbreaking research in economics, psychology, philosophy, and education, and asks readers to consider how technology is guiding humanity toward a bright future in which our children will be able to create new, better models of global citizenship, connection, and community. In our conversation, we talk about the ideas behind his book, what Jordan sees as the biggest problems with the way parents are relating to their children’s screen time usage, why he thinks it’s important for parents to integrate a child’s use of technology and their “off screen life,” and more. Just like Jordan’s book, this was a thought provoking conversation that left me thinking differently about the role of screens and technology in our family. I hope it provides you with some interesting food for thought. About Jordan: Jordan Shapiro, PhD is a globally celebrated American thought leader. He’s currently senior fellow for the Joan Ganz Cooney Center at Sesame Workshop, and Nonresident Fellow in the Center for Universal Education at the Brookings Institution. His Forbes’ column (2012-17) on global education, learning through digital play, kids and culture was read by over 5 million people around the world. He is an international speaker and consultant whose fresh perspective combines psychology, philosophy, and economics in unexpected ways. 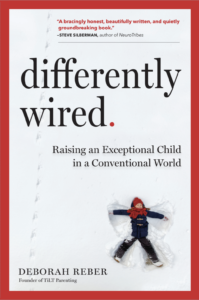 His most recent book, The New Childhood: Raising Kids To Thrive in a Connected World, was published by Little, Brown Spark on December 31, 2018. Jordan is an adviser and strategist to the United States Air Force and Thomas Edison State University, helping to shape how they provide individuals with sophisticated 21st century agile and critical thinking skills. He is also a member of Teach For All’s Global Advisory Council, an expert adviser to the World Economic Forum, and a participant in China’s Taihe Civilization Forum. During the week, you can find Jordan in the classroom at Temple University, where he teaches in the Intellectual Heritage Program and developed the online version of the university’s core curriculum. Jordan lives in Philadelphia with his two sons.